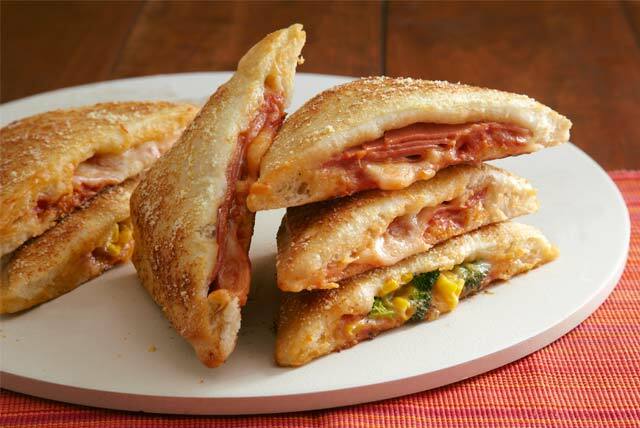 Filled with gooey cheese, tasty pizza sauce and surprise ingredients, kids love this yummy classic. 1. PREHEAT oven to 400°F. Cut dough roll in half crosswise with table knife (using ruler to judge). Unroll 1 dough half on large baking sheet sprayed with cooking spray. 2. SPREAD pizza sauce evenly down center of dough, leaving 1/2 inch around edges. Top sauce with mozzarella cheese. 4. UNFOLD remaining dough half over filling. Crimp edge with fork. 5. CUT rectangle into thirds crosswise. Cut each rectangle on diagonal into 2 pieces, but do not separate (note: this job is for mom). 6. BRUSH dough lightly with water using pastry brush. Sprinkle Parmesan cheese evenly over dough. 7. BAKE 15 to 19 min. or until golden brown. Remove from oven with hot pads. Cool on cooling rack 5 min.